I (Julie) was hoping to get some events together in April, but unfortunately a drysuit repair is going to take a few weeks, so no on-water activities until May. 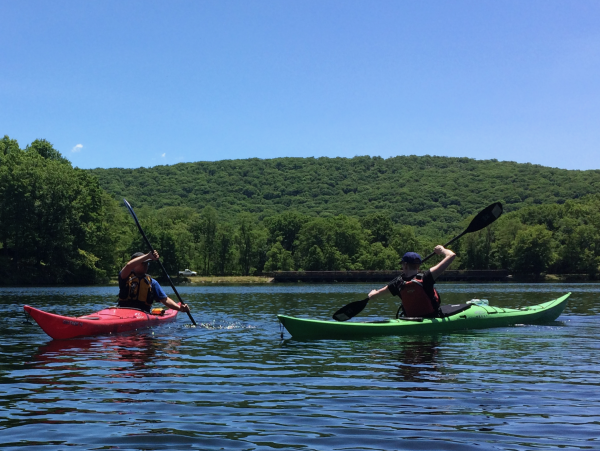 That said, I’ve super-excited to say my fourth annual weekend-long kayak touring course at Lake Sebago is set for the weekend of June 22-23. You can register here. In addition to the course, I’ve rented a cabin for participants to opt-in to stay at Friday and Saturday nights. There’s a refrigerator and stove for preparing meals, and the lake is a great getaway from urban life. I can also provide boats and a limited set of rental equipment. The course is essentially the American Canoe Association’s “L2” skills curriculuum, covering strokes and rescues. The ACA’s sample syllabus lists the course as being do-able in about a day, leading to a common question I get, almost every year: why is this course a two-day course? The main reason is that it’s a lot of material to cover, and cramming it all into a day is a bit of a smash-up. I’ve taught the course in a single day, in the past, and it becomes a long day. Students who I continued working with afterwards would remark that they didn’t feel everything stuck, and they spent more time in subsequent sessions honing in on the details. So, that’s one approach. What I prefer is to dedicate the better part of a weekend, allowing more time for practice, for reflection, and for participants to let their synapses fire on their own. It takes more time and a bit of patience, but pays off in a stronger foundation for the long haul.